Sometimes in life, you find a special friend. Someone who changes your life just by being part of it. Someone who makes you laugh until you can’t stop. Someone who makes you believe that there really is good in the world. Someone who convinces you that there really is an unlocked door just waiting for you to open it. This is forever friendship. When you’re down and the world seems dark and empty, your forever friend lifts you up in spirit and makes that dark and empty world suddenly seem bright and full. Your forever friend gets you through the hard times, the sad times an dthe confused times. If you turn and walk away, your forever friend follows. If you lose your way, your forever friend guides you and cheers you on. Your forever friend hold your hand and tells you that everything is going to be okay. And if you find such a friend, you feel happy and complete because you need not worry. 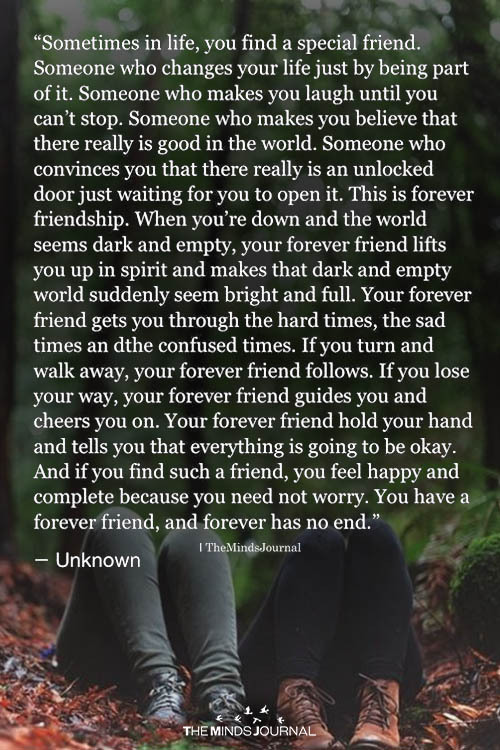 You have a forever friend, and forever has no end.